Navodaya Vidyalaya has issued the Admit Card for Computer Based Test / Examination for the recruitment of Non-Teaching Staff and Teaching Staff (Principal (Group A), Assistant Commissioner (Administration) (Group A), PGT (Post Graduate Teacher) A new notification has been issued.) (Group B), Assistant, Computer Operator (Group C) Vacancy on 251 posts. 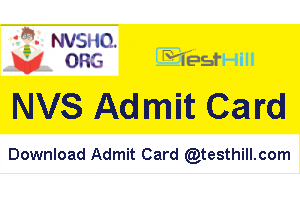 Candidates can download Admit Card for the computer-based test from here. Navodaya Vidyalaya recruitment details like age limit, educational qualification, selection process, application fee and how to apply details can check from NVS Recruitment 2019.